This is the time to think of Christmas books. Dickens started our passion, but who has time for the whole of Pickwick Papers, unless you just read the snowy, seasonal scenes? A Christmas Carol is a possibility, but, weighed down with Victorian sentimentality, it lends itself to cinematic or theatrical adaptation rather then a comfy read in an armchair. I turn to the accessible children’s stories, easy to devour over a glass of mulled wine and a few mince pies. One of my favourites, The Story of Holly and Ivy, was originally set in Aylesbury, my local town, and I think it still belongs there despite the change made in later reprints, which located the story in the anonymous Appleton. Perversely my favourite of all Christmas stories, A Child’s Christmas in Wales, simply has to be set in Swansea, the hometown of its author Dylan Thomas. Except that it isn’t. The city is not referred to by name, although there are geographical hints, like the two men with pipes striding down to the sea. It does not matter, because that is how Dylan intended it. In The Story of Holly and Ivy, it was someone’s change of mind. The author or the publisher? You can’t add to the magic of Dylan’s story by naming Swansea. But you can detract from the magic of Holly and Ivy by taking Aylesbury out. I wrote this article after a visit to Dylan Thomas’s house in Cwmdonkin Drive. 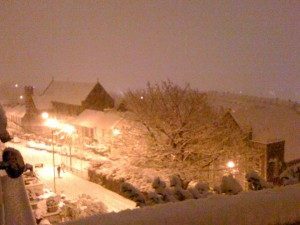 Oh, and Swansea can be as white as Lapland in December, as the picture shows. In the deep repose of an old Welsh front parlour in Cwmdonkin Drive, furnished for the early years of the last century, before the days of TV and radio, I conjured up the ghosts of Christmases past. into their brand new house. bold, and it turned out entirely authentic, burgundy paint up the stairway. to a man of words. 20th century, and gradually filled the house with authentic period detail. built since behind the property. Australia, and were delivered in days. Crucially the walls had not been re-plastered, a process that would have destroyed the original decoration. The builders stripped them down and discovered traces of the paint applied in 1914. An expert from a local paint store made an exact match. So the shade of burgundy in Mr and Mrs Thomas’s bedroom and on the stairs, the pea green on the landing, and buttercup yellow in Dylan’s sister’s room, were exactly as they were when the house was new. say some words to the “close and holy darkness” and sleep.